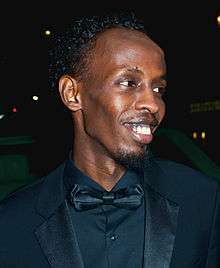 Barkhad Abdi (Somali: Barkhad Cabdi, Arabic: برخد عبدي‎‎; born April 10, 1985) is a Somali-American actor and director. He made his debut in the 2013 film Captain Phillips, for which he received various film award nominations, including the Academy Award for Best Actor in a Supporting Role, Golden Globe Award for Best Supporting Actor – Motion Picture, and BAFTA Award for Best Actor in a Supporting Role, the latter of which he won. Abdi was born in Mogadishu, Banaadir. Around the age of six or seven, when the Somali Civil War broke out, he and his family moved to Yemen to join his father, who had taken up teaching. In 1999, Abdi and his family relocated to Minneapolis, Minnesota, where there is a large Somali community. He subsequently attended Minnesota State University Moorhead. Before entering the film industry, Abdi sold mobile phones at his brother's shop at a mall in Minneapolis. He also worked as a limousine driver at a relative's chauffeur company and a DJ. Abdi made his debut in the 2013 film Captain Phillips. He played ship hijacker and pirate leader Abduwali Muse. He was cast following a worldwide search for the lead roles. Abdi and three other actors were subsequently chosen from more than 700 participants at a 2011 casting call in Minneapolis. According to the casting director, the four were selected because they were "the chosen ones, that anointed group that stuck out". For his work, Abdi was nominated for the Screen Actors Guild Award for Best Supporting Actor, the Academy Award for Best Supporting Actor, and a Golden Globe Award. He won a BAFTA Award for Best Supporting Actor. Abdi's experience in Captain Phillips was his first in the film industry. He was paid $65,000 for his role in the film. After production finished, he returned to work at his brother's store. In January 2014, Abdi read scripts for a television show. He landed a role in an episode of the series Hawaii Five-0, playing former warlord Roko Makoni. Later that year, he began work on the comedy film Trainwreck, though he did not appear in the finished film. He also appeared in the 2015 thriller Eye in the Sky, playing Jama Farah; and appeared in The Brothers Grimsby. Besides acting, Abdi has directed a film, Ciyaalka Xaafada, as well as several music videos. In 2013, Abdi began to serve as an Ambassador for Adeso, an NGO founded by the Somali environmentalist Fatima Jibrell. Abdi resides in Los Angeles, California. 2015 Hawaii Five-0 Roko Makoni Episode: "E 'Imi pono"
↑ "Entertainment Pop". ABCNews.com. Jan 21, 2014. 1 2 3 "Production Notes". The Walt Disney Company Nordic. Retrieved 19 October 2013. ↑ Goodyear, Dana (3 March 2014). "The Pictures - Contender". The New Yorker. Retrieved 6 March 2014. ↑ "Oscar nod for Minneapolis' Barkhad Abdi in 'Captain Phillips'". KARE. Retrieved 16 March 2014. ↑ Bertram, Colin (12 January 2014). "2014 Golden Globes: Old Guard vs. New". NBC Bay Area. Retrieved 16 March 2014. ↑ Ryan, Mike. "I Can't Believe I'm Doing A Scene With The Forrest Gump Guy!". Huffington Post. ↑ "Somali-American Actor Stars in 'Captain Phillips' Movie". Voice of America. 11 October 2013. Retrieved 16 March 2014. ↑ Seavert, Lindsey (October 8, 2013). "4 Mpls. men co-star in Tom Hanks film 'Captain Phillips'". KARE. Gannett Company. Retrieved October 8, 2013. ↑ "Best Supporting Actor in a Motion Picture". Golden Globe Awards. Archived from the original on 2014-02-03. ↑ Rottenberg, Josh. "Oscars 2014: Barkhad Abdi reacts to his Best Supporting Actor nomination". Entertainment Weekly. Retrieved 1 February 2014. ↑ Covert, Colin (12 January 2014). "First-time Minneapolis actor Barkhad Abdi is in "state of shock" over his sudden fame". Star Tribune. Retrieved 16 March 2014. ↑ Heilbron, Alexandra (24 January 2014). "Captain Phillips Oscar nominee Barkhad Abdi talks about sudden fame". Tribute. Retrieved 25 January 2014. ↑ "HAWAII FIVE-0 Recap "E 'Imi pono"". Seat42F. Retrieved 11 March 2015. ↑ "Judd Apatow's 'Trainwreck' Casts Up: Tilda Swinton, Barkhad Abdi and John Cena Sign On". Slashfilm.com. 2014-03-18. Retrieved 2014-05-21. ↑ Reilly, Travis (October 28, 2014). "'Breaking Bad' Star Aaron Paul Is a Conflicted Drone Pilot in 'Eye in the Sky'". TheWrap. Retrieved October 29, 2014. ↑ "Adeso Ambassador Barkhad Abdi appeals for Somali cyclone aid". Mareeg. 6 December 2013. Retrieved 14 December 2013. ↑ Lammers, Tim (5 March 2014). "Report: Fresh off Oscar nomination, Barkhad Abdi 'dead broke'". Bringmethenews. Retrieved 23 June 2014. ↑ Terence Johnson (December 9, 2013). "Detroit Film Critics Society Nominees are lead [sic] by American Hustle and Short Term 12". Awards Circuit. ↑ "Golden Globes 2014: Complete List of nominees and winners". Los Angeles Times. Retrieved 12 December 2013. ↑ Clayton Davis (December 9, 2013). "St. Louis Film Critics Nominations – Michael B. Jordan Shows Up for Fruitvale Station". Wikimedia Commons has media related to Barkhad Abdi.